« So much going on! As I write, the floodwaters of what should turn out to be the 25th worst flood on record are at their crest. Since we started the process of buying this new farm three and a half months ago, we’ve seen the 12th worst (not yet recorded), the 18th worst, and now the 25th worst flood. The first two, occurring in December and January, we observed from the comfort of our couches in Seattle, constantly refreshing Floodzilla, NOAA hydrology, USGS hydrology, Northwest Avalanche Center, and King County Traffic Cam websites to get the latest data. When we saw this flood forecast, we decided that Siri and Felix would head back into Seattle and I would remain on the farm to observe what the water does where and when, and to protect whatever might need protecting. Having been on the farm immediately after those previous two floods, I had some ideas about what the water was going to do when it hit certain milestones. Some of my predictions were right. Some wrong. 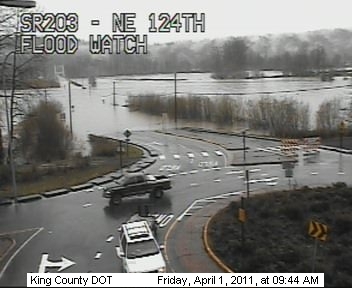 Yesterday, I thought being trapped on a shrinking island in the middle of the Snoqualmie Valley was grand. Every hour or so I’d walk the perimeter of the farm, noting where the water was, how it was flowing, which spots filled first, which later. In between my perambulations, I was tinkering in the shop, restoring/modifying an antique cultivator attachment from an Allis Chalmers G that I’m going to mount on our Cub. The weather was pleasant and the river was rising slowly, far from causing trouble. 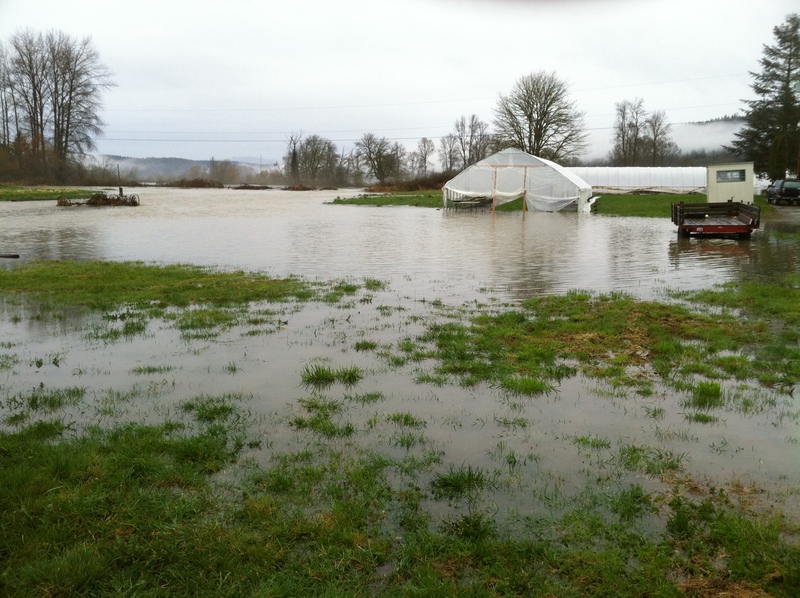 Around 4:00 yesterday, floodwaters finally began reaching the lowest fields on the farm that had already been plowed. This little detail – that we have already plowed a lot of ground – is significant. Looking across our fields right now, I worry about the erosion that may have happened as the floodwaters passed over bare dirt, unprotected by the web of grass roots that had been there one month prior. On a larger scale, I’m worried that a flood of this magnitude, this late in the year, may turn out to be one of the most costly floods to agriculture in this valley. If you clicked on the Snoqualmie River Historical Crests link above and looked at the dates of the big floods we’ve had, you’ll notice that the biggest flood in the month of April was two and a half feet lower than this one. And with a crest of 58.21 feet, this flood is the second largest flood to ever occur in the month of March and April; the fourth largest flood in this two month time period was two feet lower than this one. 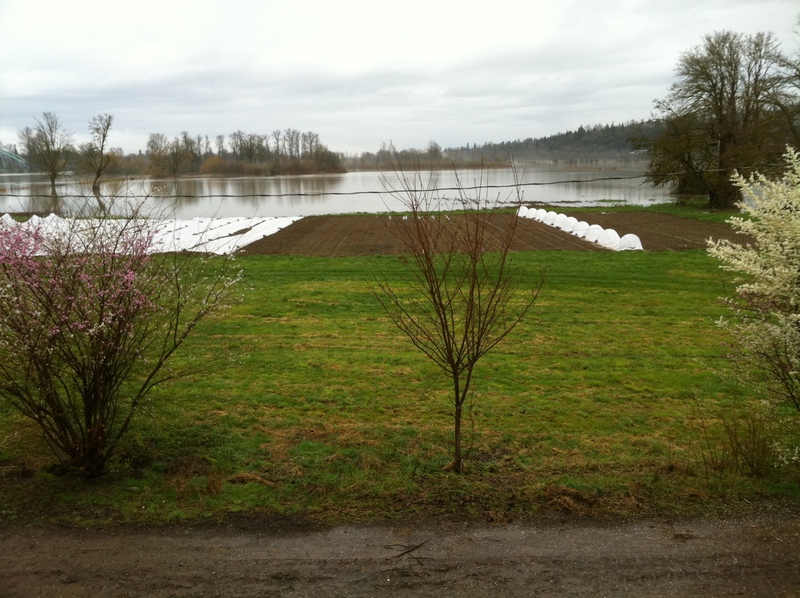 The reason this unusually large and late flood may be more costly than other, larger floods, is that most farms in this valley have already begun working their soil. 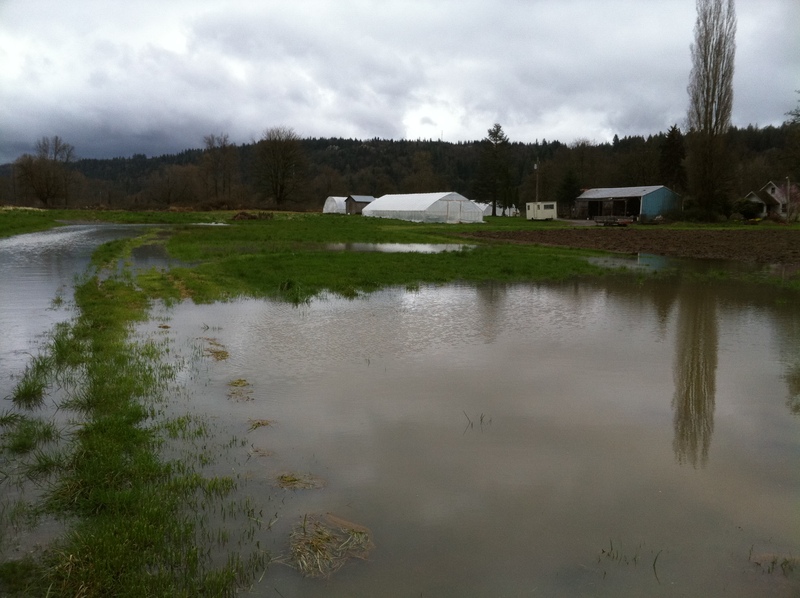 When floodwaters flow over a field with cover crops or grass, there’s little erosion. Were the same field bare dirt, the water could wash away a tremendous amount of topsoil. If that field were planted already, seeds or seedlings could be lost too. On our farm, I observed water flowing over the beds where we planted garlic and peas. 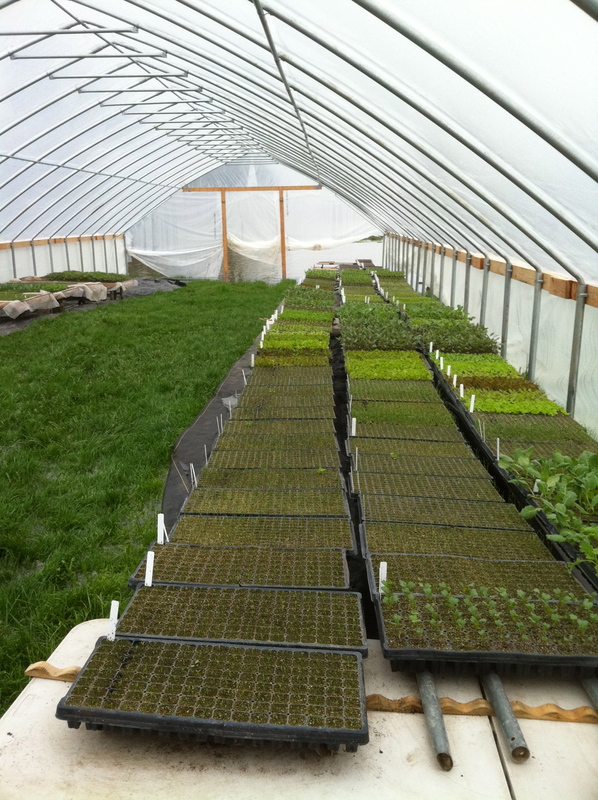 Our hope is that the flow wasn’t too erosive and/or the veggies had grown enough of a root system to hold themselves (and the soil around them) in place. Last night, around midnight, I noticed that the river had jumped its banks directly behind where we sited one of our greenhouses. 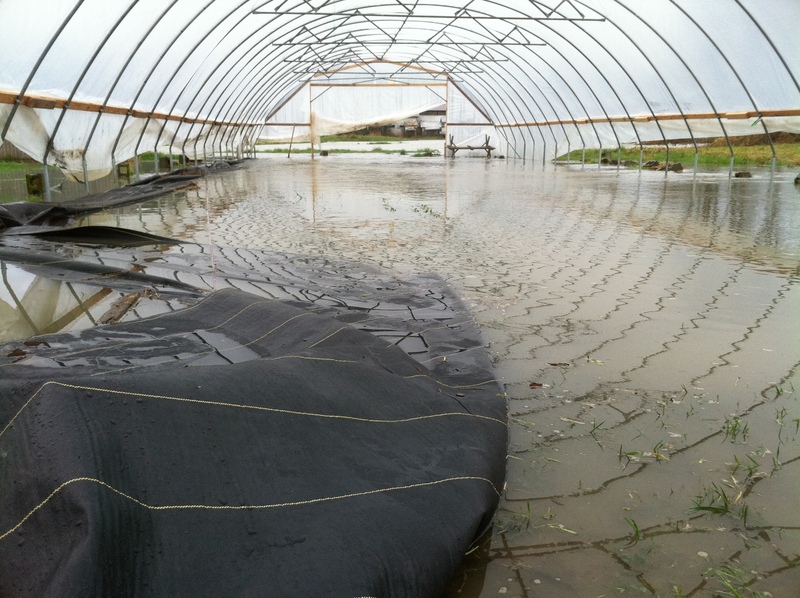 Although the water was only an inch deep, it was flowing directly at one of our greenhouses and I was worried that the force of the water pinned against a solid plastic wall could contort and destroy the entire greenhouse. 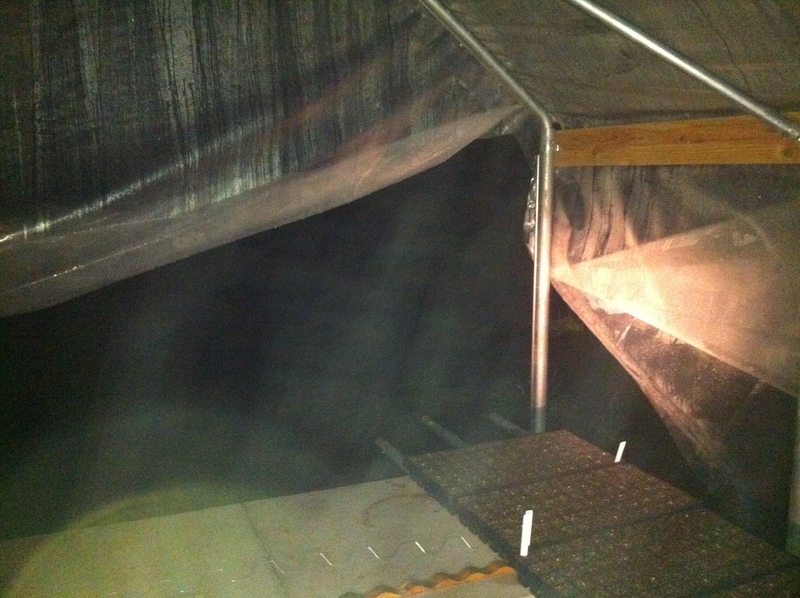 Working in the rain by flashlight, I raised the sides of our greenhouses above the flowing water. In retrospect, a flood of this size probably didn’t warrant lifting the sides, but at 2:30 in the morning I was rather tired and wasn’t interested in staying up to make sure everything was going to be ok. Finished at 2:30, I walked the rather small perimeter of my island, putting markers down where the water was, and went to bed for two hours. I woke again at 430 to make sure that there were no significant changes to the flow that would further endanger any of our greenhouses and to observe my marks. The water had risen almost a foot in those two hours, but wasn’t close to the lifted skirts of the greenhouses, so I moved my markers to the new high-water mark and went back to bed. Siri called and woke me up this morning at 8, just in time for me to take a bunch of pictures at the peak of the flood. It has since started to recede – about six inches since 8 this morning – but basically still looks like it did at 8. My island is now growing again, and should become a peninsula once more sometime tomorrow afternoon. I’ll spend my last day as a marooned farmer continuing to tinker with antique farm equipment and getting the old farmhouse ready for Siri and Felix and I to move into on Monday. Looking North from upstairs in the farmhouse at 2 dry, 38 wet acres. I just moved up to an acre of land in the Skagit Valley and am starting to become familiar with this same routine, though I’m generally the one sent to town during the flood. Fingers crossed for your fields. Hope the peas hang on! Good luck Garlic!! Hi Jason, thank you for the updates. I am next door at Jim’s (well, not at the moment for obvious reasons, but most of the time otherwise..). My airstream is up on the critter pad, which you can probably see from your house – I hope it stayed high and dry. I’ve been boarding my horses and working at the farm for 5 years now and have seen quite a few floods come and go. Always an exciting time! I’m looking forward to meeting you and Siri soon, and wish you guys all the best this summer with your new farm. Guys, Let us know if you need help with anything, we could mission down there for a day. I will be back in town Sunday if you need help refurbishing the farm. Kitties want their catnip safe. Also the farmers! I rejoice at your starts, but my heart breaks looking at the flood and its damage. Good fortune with the clean up. I hope that you’re not right about losing a lot of topsoil when the waters recede. May the remainder of your spring be calm and productive.